Have gained popularity all over the world and is currently one of the fastest growingsectors of the leisure industry. A professional company that helps you plan, realize and follow up your individualized project. Whether you are in a forest, theme park, golf course, shopping mall or tourist resort, we can build the most appropriate structures for your project. 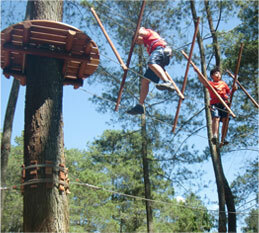 SkyZip Engineering can build treetop parks, giant ziplines, challenge courses, artificial structures and treehouses. Our parks and ziplines will attract families, tourists, corporate groups and schools. Helps you evaluate your needs according to your target market and business plan. We bring technical solutions based on our strong experience and expertise.